I love mixing pistachios with dark chocolate so much. Every time after trying out a new recipe with success I start making a list of possible variations and there's always a 'pistachio version'. 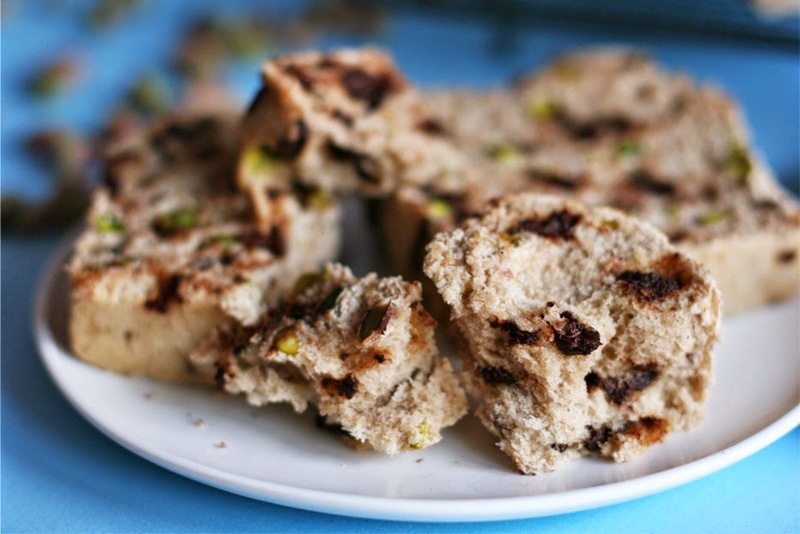 I think "hmm, these cookies will taste great with some pistachios" or "why don't we try to decorate this cake with chopped pistachios next time?". I'm not very fond of simple white bread, I like my bread wholesome, with nuts, cereals, dried fruits, etc. The complexity of flavors is far more interesting and there are so many different kinds of combinations. 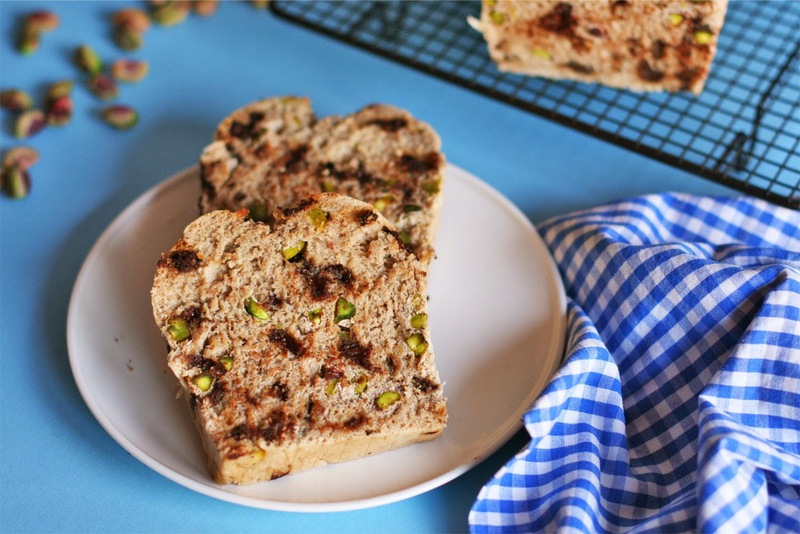 One I am very obsessed with is bread with dates, apricots, almonds and hazelnuts....so darn addictive! 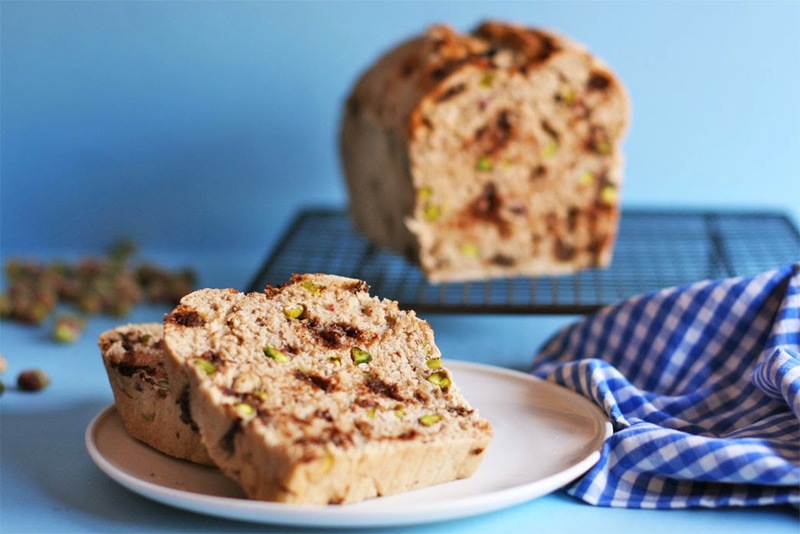 This loaf bread is perfect for a breakfast to enjoy alone or with some of your favorite jams (I prefer to eat a big slice 'au naturel') or for a picnic. It's very tender and not too crumbly so you'll get really nice slices. 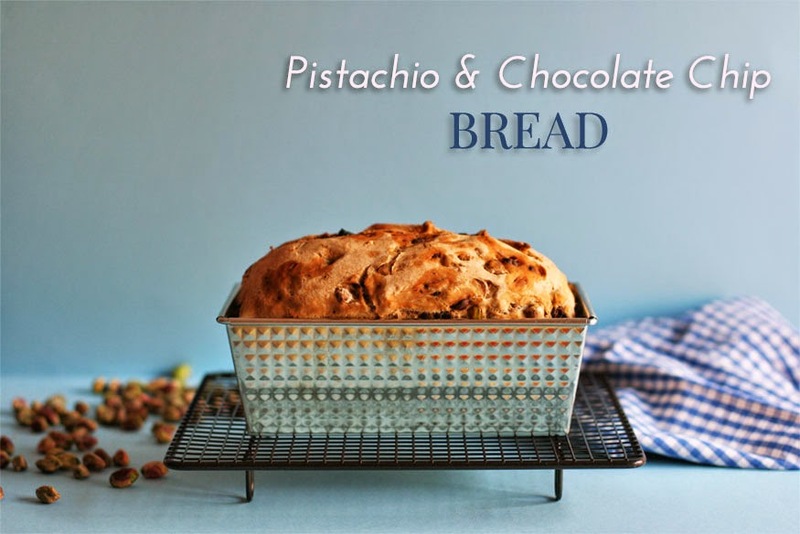 If you don't like pistachios it tastes as good with walnuts or your favorite nuts, just let your imagination run and try different combinations! 4 cups (500g) bread flour. Scant 1/2 tbsp (8g) salt. 2 tsp approx. (1 sachet of 5.5g) dry yeast. 1 cup plus 1/4 cup (300ml) water. 3/4 cup (125g) pistachios, shelled. 3/4 cup (125g) dark chocolate chips. In a large mixing bowl mix together the flour, dry yeast, cinnamon, salt and water. Combine all ingredients until the flour has absorbed all the water and we get a paste-like dough. 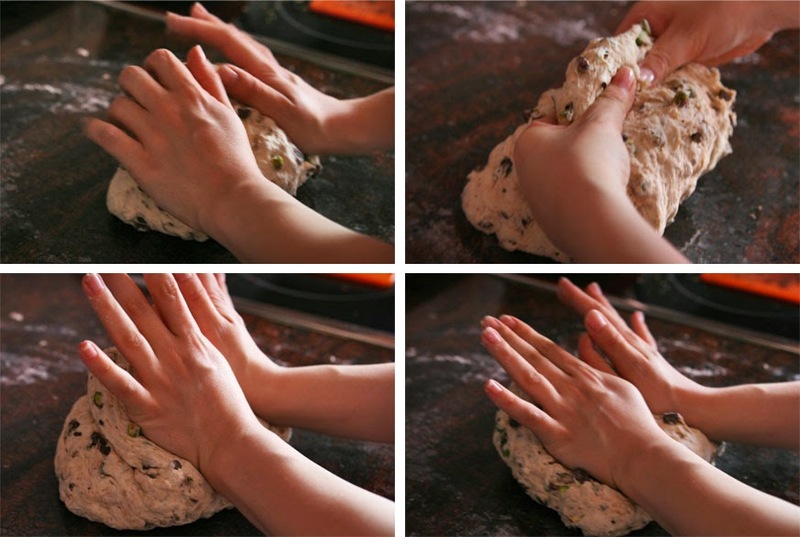 Then it's time to place the dough on your working surface dusted with some flour and start hand-kneading until we get a soft and elastic dough. 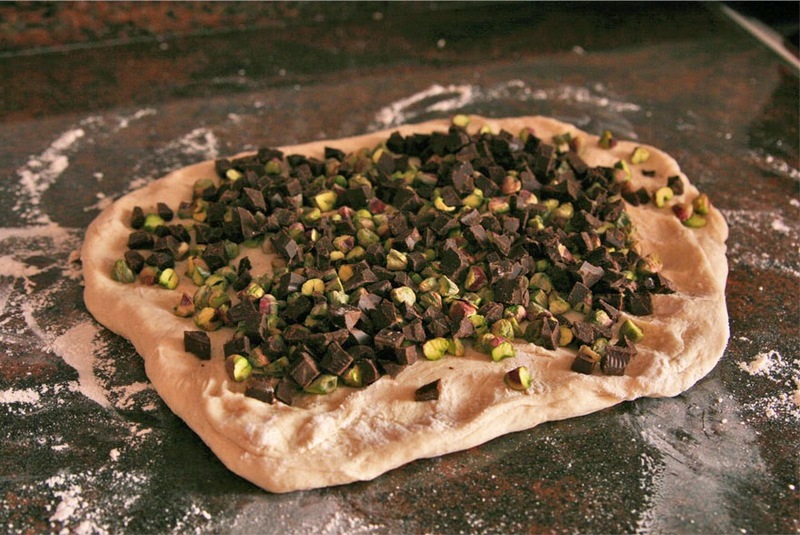 Right before finishing the kneading add in the chocolate chips and pistachios. A good trick is to roll out the dough a bit and sprinkle the chips/nuts all over. 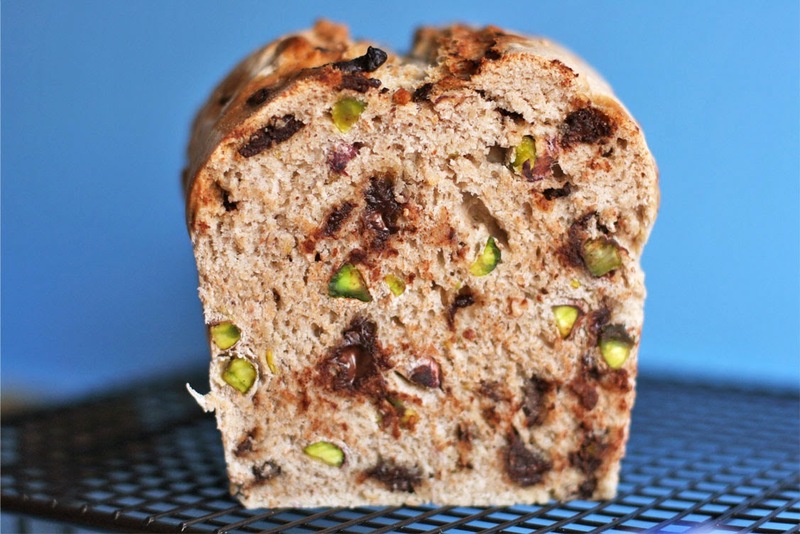 Knead the bread a bit more until the chocolate chips and pistachios are well distributed. Transfer dough ball into a large bowl covered with a damp cloth. Let it rest 90 minutes in a warm place free from air drafts, until it has doubled in volume. Once the dough has risen knead the bread just a bit more (to release excess gas), shape it and put it in the loaf pan. Cover and let it rest for 30 to 40 minutes (until it has almost doubled in volume again). 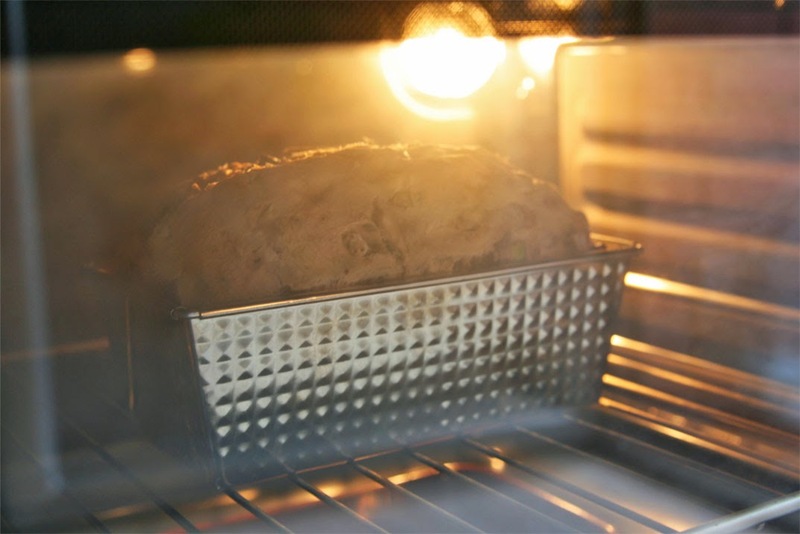 Halfway through the resting time preheat oven to 482 ºF (250 ºC) and place a pan of water inside to get steam. Right before baking the bread lower the temperature to 410 ºF (210 ºC) and score the bread (make a cut along the length of the loaf). Bake 20-25 minutes until the top is golden brown. 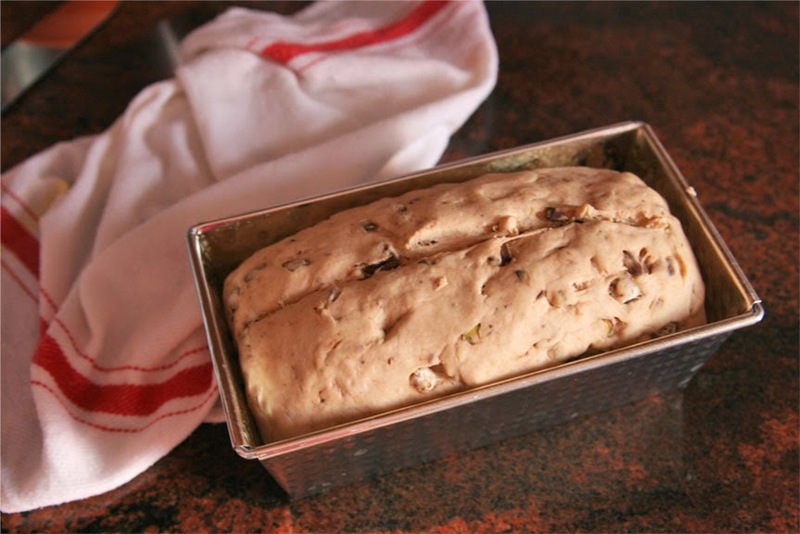 Let the bread cool inside the pan for 5 minutes and then transfer to a wire rack to cool completely. A mí me encanta para desayunar y sobretodo para merendar, jeje.